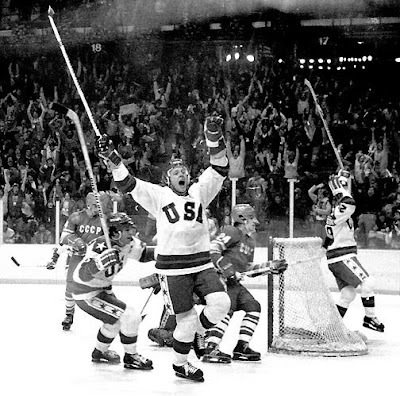 Photos of the real thing aside, the movie Miracle is a Disney Sports Drama. It will make you laugh, make you think you have something in your eye, root for the good guys, and repeatedly mention that the CCCP "shows no emotion." Disney's been in the business of clearly delineating the Good Guys and Bad Guys for a long time, and they excel at it. 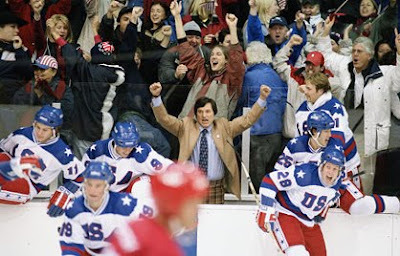 In this case instead of plucky young team The Mighty Ducks, it's the Historic 1980 US Men's Olympic team, coached by Herb Brooks (played fantastically by Kurt Russell). If you're an American hockey fan, still hate the USSR, are looking to get psyched for the Vancouver 2010 games, or are just plain looking for a triumphant flick to pass the time, I highly suggest picking up this particular one. 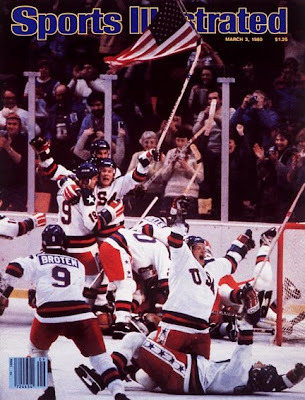 Of course, the hilarious thing is that the US didn't play CCCP in the gold medal game, though you'd only know it in the film if you listen very closely after they beat the soviets. The on-ice action is pretty well done, the acting is good enough, and there are enough quotable moments. 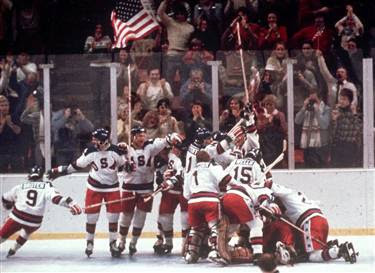 It was a great moment in US Hockey history, and a fun film to boot. Get it now from your local library/movie rental/netflix/whatever and watch it! I'd also like to take this time to point out that the US olympic team has the potential to surprise some people. Although jerks like Ryan Kesler have already guaranteed a win and a victory over Canada, I'm cautiously optimistic about the USA team's chances to at least medal. I see Canada, Sweden, and USA duking it out for who gets to lose to Russia in the Final. This blog will be covering the olympics from our parents basements just like we do for the Bruins. Here's to Timmy and Phil making it happen 30 years later.